Annual Bluegrass Weevil Adults Emerging: What Now? Adults of the annual bluegrass weevil (ABW) spring generation have started to emerge in significant numbers over the last few days at Rutgers Hortfarm 2 in New Brunswick and at golf courses in North Jersey. 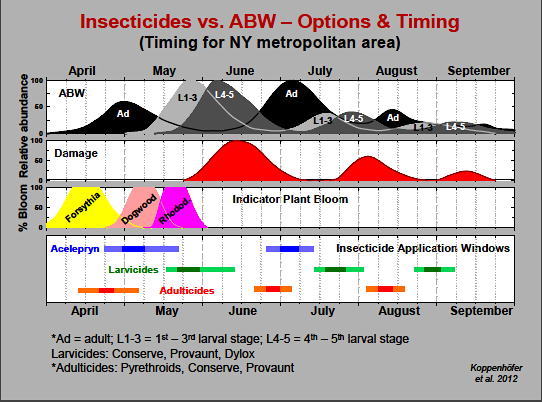 Peak densities of new ABW adults should occur throughout the central and northern New Jersey and the NY metropolitan area over the next 1-2 weeks. These spring-generation adults mate and will start laying eggs quickly. The resulting second generation is present predominantly as large larvae around late July-early August, when additional damage — usually less severe than spring damage — may occur. The second generation pupates in August and starts emerging as adults around mid-August. Areas where significant adult densities are observed (directly, in clippings, with soap irritant, or by vacuum sampling) in late June-early July may need to be treated. However, overuse of insecticides, particularly of pyrethroids, is likely to lead to the development of pesticide-resistant ABW populations. To avoid this highly undesirable scenario insecticides should be applied only where and when necessary and pyrethroids should be used no more than once per year. The need for an application has to be based on the risk for damage. Risk to an area increases with increasing percentage of annual bluegrass in the sward, if there is a history of infestation, and obviously with increasing density of ABW adults (or later larvae) observed. Soon after detection of significant adult numbers, use an adulticide such as Provaunt (indoxacarb, 0.225 lbs a.i./acre) or Conserve (spinosad, 0.4 lbs a.i./acre) (use product with a mode of action different from that used against spring-generation larvae). In areas with particularly high risk (see above) a pyrethroid may be used instead [Talstar (bifenthrin), Tempo (cyfluthrin), DeltaGard (deltamethrin), Scimitar (lambda- cyhalothrin)]. Where insecticide resistance is suspected, products containing chlorpyrifos may be used instead (1.0 lbs a.i./acre). Although the pyrethroid-neonicotinoid combination products Allectus (bifenthrin + imidacloprid) and especially Aloft (bifenthrin + clothianidin) are also effective when applied as adulticides for annual bluegrass weevil control, they seem to provide no additional benefit compared to application of bifenthrin alone against pyrethroid-susceptible ABW. Therefore, use combination products only if white grub control is also needed. If significant numbers of larvae are detected (likely around late July-early August), Provaunt, Conserve, or Dylox (trichlorfon, 8.1 lbs a.i./acre) may be used. Larvicides must be washed off the foliage into the thatch and top soil with 0.1-0.2 inch of water soon after application. For more detailed info see Koppenhöfer et al. (2012: Controlling annual bluegrass weevil: optimal timing and rates. Golf Course Management, March 2012, 98-104), Koppenhöfer et al. 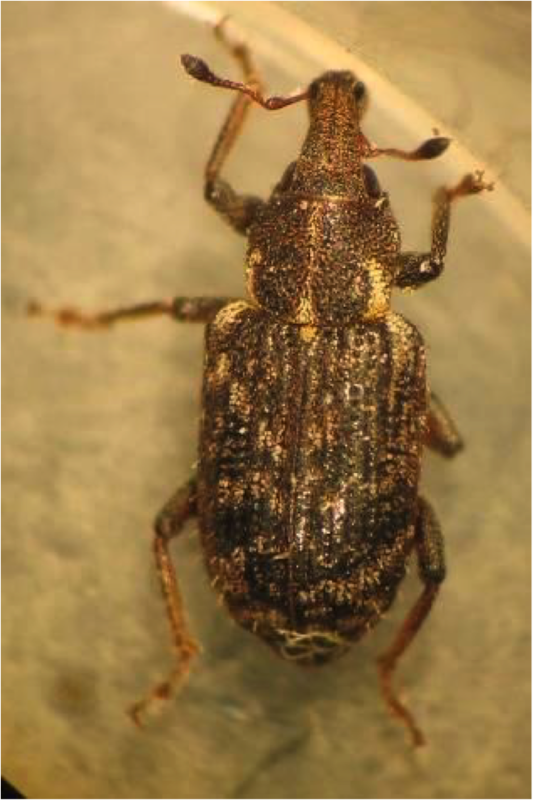 (2012: Managing pyrethroid-susceptible annual bluegrass weevil. Golf Course Management, April 2012, 104-110), and ABW presentation on my webpage (http://www.rci.rutgers.edu/~insects/amk.htm).